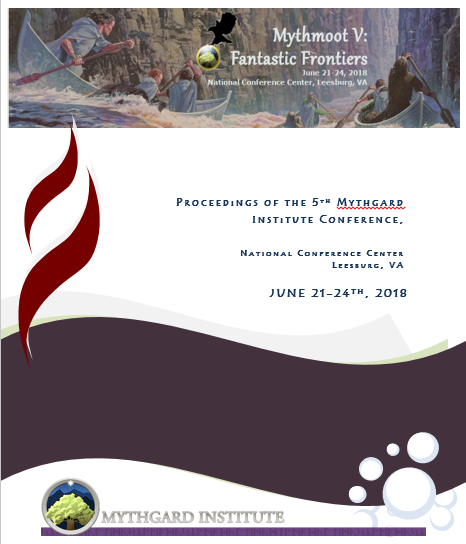 Mythmoot V: Fantastic Frontiers took place at the National Conference Center in Leesburg, Virginia from Thursday, June 21st through Sunday, June 24, 2018. The program included special guests John Garth, Douglas Anderson, Marc Okrand and the Prancing Pony Podcasters, Alan Sisto and Shawn E. Marchese; as well as a new “Room of Requirement” activity space and Project Paparazzi, a photo contest featuring Signum’s illustrious president and the submissions of which can beat at the bottom of the event page. As always, paper presentations by conference participants covered a wide range of topics in speculative fiction. Imaginative Literature – Science Fiction, Fantasy, and Speculative Fiction from Mary Shelley and H.P. Lovecraft to Ursula Le Guin and Neil Gaiman, exploring how these works depict or enact fantastic frontiers, their creation, and their transcendence. Tolkien and Inklings Studies – Research on the works and lives of Tolkien, Lewis, Williams, Barfield, and their friends and contemporaries as they interact with each other, their modern context, and classic and imaginative literature, especially as they explore boundary-crossing. Germanic Philology – Research on the relationships between language and literature in the past, present, and future. Page through the proceedings below by clicking on the squares above the cover or check out the work of a specific presenter by using the presenter list. A playlist of videos from this Moot is also available on Youtube. Happy reading/viewing! Souls and Concealment: the Fidelius Charm as an Inverse Horcrux in the Harry Potter Series / Austin, Emily. In J.K. Rowling’s Harry Potter septology, the concept of the soul runs centrally through both the plot and the fantasy world’s workings. To Rowling, the soul functions as an individual’s spiritual and moral center, and a healthy soul depends symbiotically upon good relationships with others. Horcruxes—dark objects created by splitting one’s soul through an act of murder—epitomize the opposite of this, and become an avenue through which Rowling explores, in reverse, the soul’s relationship to essential humanity. In the Potterverse, a normal human soul can survive beyond its body, but any soul fragment encased in a Horcrux cannot exist if its container is fatally compromised. While this contrast between Horcruxes and human beings certainly forms an illuminating dichotomy, we might also place Horcruxes in opposition to other magical processes shown within the series. One particular spell, the Fidelius Charm, is equally concerned with concealment, but it acts by placing information inside a person—indeed, we learn that the charm hides information within a living individual’s soul. Unlike a Horcrux, the Fidelius Charm does not require damaging the involved soul; one might even suggest that an undamaged soul would be more effective than a split one in carrying out the spell’s aims. Because of the different ways these two spells use human souls, we can view the Fidelius Charm as an inverse Horcrux. The former is presented as inherently relational, while the latter represents extreme self-determination, to the detriment of all others. Comparing these spells leads us to key insights about the moral framework of Rowling’s universe, highlighting the importance of human relationships based on love and self-sacrifice. Borders in Austin Tappan Wright’s Islandia / Brierly, Trevor. Borders are a pervasive theme in Austin Tappan Wright’s Islandia, a utopian fantasy largely set in Islandia, an imaginary country located in the southern hemisphere of our Primary World. Islandia was the work of a lifetime’s imagination for Wright, and it is regarded as a world-building masterpiece by many. Islandia tells the story of John Lang, a young man serving as American consul to Islandia. Literal borders are an important part of the story as Lang moves between Islandia and the United States, and between provinces within Islandia. Lang also becomes involved in a border dispute and skirmish which results in him being invited to stay in Islandia. The country itself is in the process of deciding whether to end its near-total isolation from the rest of the world and remove some of the cultural and psychological borders it has set up with the outside world. John Lang is deeply affected by his time in Islandia, and he navigates the borders of culture and psychology between himself and the Islandian men and women he interacts with. He comes to realize that Islandia is his true home, and he settles there along with his American wife Gladys, who has her own “border crossing” to negotiate. This paper will examine the way borders are used in Islandia to portray places of transition between the familiar and the new. Borders will also be discussed as areas of tension and danger which also hold the potential of heroism. Finally, borders will be examined as places where characters pass into areas in which they discover more about themselves, and perhaps find a true home. Constructing the Map of Middle-earth: Fan Cartography’s Engagement With Tolkien’s Legendarium / Danielson, Stentor. Geographer Jan Broek observed that a map cannot highlight its own constructedness in the same way that a text can. Maps are thus prone to being treated as undistorted mirrors of nature. This is evident in the differences between how texts and maps in Tolkien’s legendarium are treated, both by the author himself and by fans. Tolkien was very conscious of the constructedness of his texts, highlighting their in-world authorship and thus their partiality, but he treated his maps as guides to objective geography. Likewise, fans have embraced the opportunity to rethink the authority of Tolkien’s texts, but have treated his maps as pure repositories of fact. A survey of fan cartography demonstrates the way the map’s objectivity is taken for granted. The Bitter Watches of the Night: From Anne Elliot to Éowyn of Rohan — Crossing Frontiers from the Home front to the Battlefront / Ewing, Jennifer. This presentation will discuss the nearly twenty commonalities found between the two women as they cross the frontier from the home front to the battlefront, including their paternal and sibling relationships, familial duties, appearances, choices of husbands, motifs of loneliness and death, and decisions about their futures. Even though they reside in two very different genres, by the end of their respective novels, these women become independent and resilient, knowing their own minds. Ye Olde Printing Press / Fox-Lenz, Alicia. Gutenberg’s invention of the printing press in 1436 greatly revolutionized the English language through homogenizing the written language. Movable type, and the broader literacy it allowed, necessitated the standardization of English spelling, vocabulary, grammar, and dialectal varieties. This invention, widely in use by 1470, helped to bring an end to Middle English and usher in the age of Early Modern English, much like the 15th century marked the end of the Middle Ages and the beginning of the Renaissance. The focus is on the standardization of spelling and the accelerated loss of “special characters,” such as þ (thorn) and ʒ (yogh), due to the constraints of technology of movable type. Tolkien’s Crossing of Revisionary Boundaries / Gavaler, Chris & Goldberg, Nathaniel. Some novelists revise their stories by restarting them. Others revise by revealing new things about them. Still others revise simply by continuing them. All of these kinds of revisions are common, but J.R.R. Tolkien crossed revisionary boundaries by engaging in all three simultaneously. In 1937 Tolkien published the first edition of The Hobbit, or There and Back Again. In 1951 he restarted the story by publishing the second edition; among other changes, Tolkien replaced the initial account of Bilbo’s encounter with Gollum (in Chapter 5, “Riddles in the Dark”) with a darker version. In 1954 in The Lord of the Rings (in the Prologue and in Book 2, Chapter 2, “The Council of Elrond”) Tolkien revealed that the initial account was a “lie” and the darker version was “the true account” of what had actually happened. Also in The Lord of the Rings, Tolkien continued the darker version from the 1951 edition of The Hobbit directly. Using Tolkien as our exemplar, we identify these three kinds of revisions—restarts, revelations, and continuations—as reboots, retcons, and sequels, and determine the necessary and sufficient conditions for each kind of revision. We conclude that the 1951 editions of The Hobbit and The Lord of the Rings stand in multiple revisionary relations to the 1937 edition. Tolkien crossed revisionary boundaries in his different works: sometimes even in the same ones. But Where Can Wisdom Be Found? The Lord of the Rings and Wisdom Literature of the Hebrew Bible, Specifically in Proverbs, Job and Ecclesiastes / Gustafson, Mattie E.
Wisdom literature is a unique kind of writing that evolved in the ancient world as soon as mankind began to explore the meaning of life and sought understanding and insight. The Hebrew Bible contains three canonical books that scholars consistently identify as Wisdom Literature: Proverbs, Job, and Ecclesiastes. This presentation offers the idea that this body of literature and Tolkien’s Lord of the Rings have much in common. We can compare The Lord of the Rings to wisdom literature in two ways. First, there are some quick, overall and interesting similarities that can be identified and discussed briefly: did you realize that both Lord of the Rings and the book of Job begin and end with a folktale? We can also look at each Wisdom book and compare it separately and directly with elements in the Tolkien saga: Frodo and Job both go on a journey (Frodo’s is physical; Job’s is psychological, but many parts of their journeys are similar). The most telling observation however, comes when looking at all three wisdom books together. These three books are separate and offer quite different explorations of meaning and understanding, but they build on each other and taken together, leave us with a nuanced and complex view of the world. Lord of the Rings does the same thing and contains many of the views and understandings that are expressed in the three wisdom books. The biblical canon is closed, but it is my contention that wisdom literature lives and breathes and is being created, even today. Could Tolkien’s Lord of the Rings be the new wisdom literature? Isaac Asimov and the Rise of the Nerd-Hero / Harrow, Arthur. Early science fiction leaned towards the adventurous, with brave, brawny heroes, marvelous mechanisms, and a sometimes condescending attitude towards those with an intellectual bent. All this changed in 1941 when Isaac Asimov burst onto the scene. Asimov’s works gave heroes to boys who were not muscular and to girls who did not want to scream and be kidnapped, and changed the face of science fiction forever. I propose to examine earlier science-fiction heroes and discuss how Asimov opened new frontiers in imaginative fiction, providing heroes and role models for those of us who might be called, for lack of a better word, nerds. The Implicit Theology behind the Manner of the Embodiment of Tolkien's Elves / Hensler, Kevin. The implicit theology behind the embodiment of Tolkien’s elves holds enormous significance for the SilmFilm adaptation as well as the understanding of Tolkien’s entire legendarium and his worldview. This paper explicitly explores this theology and its implications for a number of Tolkien’s published works, most centrally the Athrabeth Finrod ah Andreth from Morgoth’s Ring. We will also take up themes from two previous papers: “Consideration of Gender-Embodiment in the Works of J. R. R. Tolkien” as well as “Soteriology through Tolkien and Lewis,” hopefully fostering some interesting conversation among general Tolkien fans, SilmFilm fans, and those interested in theology. Soteriology of Non-Human Sentient Beings (or Hnau) through the Reimagined Battlestar Galactica / Hensler, Kevin. My previous paper “Soteriology through Tolkien and Lewis” focused primarily on the soteriological status of non-human sentient beings (to use Star Trek terminology), or non-human hnau (to use Lewis’s terminology from his Space Trilogy), through the works of Lewis and Tolkien. The exploration of non-human hnau soteriology is also a major theme In the reimagined Battlestar Galactica series which ran from 2004-2009. The series goes in a direction Tolkien and Lewis did not, however, in that it explores the soteriology of creatures originally created by other creatures “playing God.” Tolkien addresses this idea in a very limited manner with consideration of Aulë’s creation of the dwarves, and Lewis may also go into the subject in The Abolition of Man, but it is not a primary focus of either one. While Battlestar Galactica’s soteriology is not necessarily pinned down or entirely coherent, it does give us a great way into this very interesting topic, and will hopefully prompt some great discussion among both sci-fi fans and those interested in theology. The Unreliable Future in Two William Gibson Novels / Hoffman, Joe. William Gibson in the 1980s wrote a series of works that established cyberpunk fiction as a slick, stylish view of a bleak, dystopian future, but by the turn of the century much of what he’d written about had recognizably come to pass. Actuality is a border between the world-that-is and future worlds-that-could-be. Science-fiction stories look across the border, into the frontiers of “the future”. For Gibson, adapting to his involuntary change of genre began by returning to one of his old books. Pattern Recognition (2003) is essentially the same book as Count Zero (1986), but aimed sideways along the frontier, instead of across it. This paper will explore the relationships between the two novels, showing how their common theme—the relationship of art to society—turns from a quasi-religious respect to a cynical quest for commercial exploitation. In our new dystopian present, the old past-future frontier is destroyed, and a new frontier emerges within the text to replace it. “The Alienness Between Them”: Planet of Exile and Frontiers of the Human / House-Thomas, Alyssa. The late Ursula K. Le Guin is best remembered for her body of groundbreakingly anthropological imaginative literature, with its distinctive ethnographic lens which from first publication pushed science fiction to new frontiers of humanism, and which continues to inspire seekers after human connection today. In this the year of Le Guin’s decease, a year when the world seems more fragmented by tribes, ideologies, and borders than ever before, it is an opportune time to revisit Le Guin’s classic Planet of Exile. While part of a larger story cycle, when considered in isolation this novel is an elegantly self-contained exploration of Le Guin’s frequent theme of common understanding reached, of the spark of recognition and connection that may come when human souls reach out to each other across the chasms of their difference and ignorance. A simple romance between protagonists becomes so much more, set against a backdrop of physical and cultural dissimilarities. At the same time, the territorial aggression of an adventurous foe leaves little room for identification or appreciation, demonstrating that some frontiers are harder to cross than others, and fear of the alien and the interloper is too an enduring part of the human experience. Both a philosophical narrative of cross-cultural triumph and a traditional conflict-adventure story tracing a bright border between “us” and “them”, Planet of Exile has much to say to us about the frontiers we have already crossed, and those we may yet conquer. The Bicameral (Hive) Mind: Westworld in Conversation with Forensic Fandom / Johnson, Thomas. This presentation will examine how the reception of HBO’s Westworld reflects a larger debate among television critics about the validity of fan theorizing as a mode of viewer engagement in the age of peak TV. The responses of prominent critics to Westworld reveals an increasingly moralistic stance towards puzzle-box television and the “forensic fandom” (Mittell 114) that dissects its mysteries online, at a time when the outlets publishing these responses are leveraging forensic fandom in order “to turn Westworld into another consistent traffic-generating series in the vein of Game of Thrones or The Walking Dead” (McNutt). the show’s incentivization of repeat viewing allows forensic fans to ultimately become thematizers, and vice-versa. The Composite Nature of “Andreas” / Maddock, David. The Old English poem “Andreas” has long been a source of controversy in the Anglo-Saxon scholarly community. Although it bears no runic signature, scholars have noted significant stylistic similarities between “Andreas” and the four signed poems of Cynewulf, suggesting that they may share a common author. Others have cited affinities with Beowulf or grammatical differences from Cynewulf to argue against Cynewulfian authorship. By correlating quantitative analysis of oral-formulaic language with the lexomics techniques of cluster analysis and moving ratios pioneered by Dr. Michael Drout, this paper demonstrates the existence of an older Beowulfian core around which a Cynewulfian poet built the received poem. Understanding the composite nature of “Andreas” can bring fresh data to a notorious scholarly controversy. Political Prescience: How Game Theory Solves the Paradox of Foreknowledge in Dune / Nardi Jr., Dominic J. In Frank Herbert’s sci-fi classic Dune, Paul Atreides uses the power of prescience to see into the future. However, prescience presents a paradox. If a person possesses knowledge of the future, can he/she also possess free will? On the one hand, Herbert describes prescience as the ability to view all possible futures, not merely the future. Moreover, prescience is limited by external factors, much like the human sense of vision. On the other hand, those with prescience generally treat their visions as reliable. In Dune Messiah, Paul could still “see” the world after becoming blind because he remembered details from his visions. In Children of Dune, Paul’s son Leto bemoans the fact that prescience robbed him of the joy of being surprised. In this paper, I argue that prescience in Dune can be understood as a way to solve complex game theoretic models. Like prescience, game theoretic models show all possible futures based on all possible decisions an individual can make. With enough information, it is possible to determine which branch of the game is most likely to occur. In this state, none of the players will make a different decision, even though they have the free will to do so, because the mix of opportunities and threats from other players will compel them down that path. This analogy helps explain how prescience allows us to determine which possible future will occur, even while still having the potential, if not the incentive, to change that future. I then explain why prescience proved so devastating to the political status quo in Dune. Before Paul, political power was structured around uncertainty and the inability of ordinary political leaders to see the future. I use a bargaining model to show how prescience enables Paul to take extraordinary risks and to consistently win. Inner Limits: Metanoia in The Lord of the Rings / Neville, Kate. Tolkien’s legendarium is full of physical boundaries which serve as catalysts of change for the characters who encounter them. Sometimes, however, the most difficult boundary to cross is psychic rather than physical: the Greek word for this is metanoia, a fundamental change in one’s understanding of self. It is almost a psychological form of eucatastrophe, but metanoia requires the active participation of the self. This paper with look closely at three unambiguous examples of metanoia in The Lord of the Rings — the stories of Gimli, Théoden, and Éowyn. A close reading of their experiences illuminates subtler examples in the trilogy as well as the dearth of metanoia in The Silmarillion. “This place is different. It’s special.”: Mythical Geography in Lost and The Leftovers / Sas, Katherine. This presentation will explore the role of mythical geography and sacred places in two television series created and written by Damon Lindelof: ABC’s Lost and HBO’s The Leftovers. Starting with a brief survey of these motifs in folklore to build context for their literary precedents and significance in the modern imagination, the talk will focus primarily on a comparison of the Island in Lost and Jarden, TX (aka “Miracle”) in The Leftovers, I will track the importance of these locations as sites of magic, sacredness, and community. Getting Sick of It: Narrative Functions of Sickness in Egils Saga Skallagrímssonar and Laxdæla Saga / Smith, Laura Lee. Many characters die in the course of Egils Saga Skallagrímssonar and Laxdæla Saga, most from battle wounds or homicide, and some from old age or other natural causes. Characters may also take to their beds for various reasons, including grief. But in some instances, the narrator specifically reports that a character is sick. Such mentions warrant attention, because “illness and healing are not presented as central themes of medieval Scandinavians’ mythical understanding of the world” (Hall 196). Indeed, illness in these two sagas, where it is mentioned at all, serves one of three main narrative functions. The first function may be simple “housekeeping”: that is, death moves characters off-stage or furthers the plot by setting up inheritance disputes or the like, and illness is an efficient way of justifying a death without special groundwork or explanation. The second function is that an illness, foreseen by the sufferer to be a fatal one, gives him one last chance to influence the future. The third function is that of a temporary disability that reveals something about the sufferer’s mental or emotional state, or other qualities that would have remained hidden. “A translator is not free”: J. R. R. Tolkien’s Guidelines for Translation and Their Application in Sir Orfeo / Weyant, Curtis. The Postmodern Kaleidoscope of London Below in Neil Gaiman’s Neverwhere / Yokel, Christopher. In Neil Gaiman’s first novel Neverwhere, an ordinary Londoner named Richard Mayhew is ushered into the fantastical underworld of London Below when he helps the mysterious injured vagrant girl, Door. After crossing paths with her and getting caught up in her story, Richard must traverse the shadowy and dangerous realms of the London underworld. In London Below, Neil Gaiman has crafted a postmodern kaleidoscope of a world that melds literary elements such as Greek mythology, Atlantis, Dante’s Inferno, Paradise Lost, Alice in Wonderland, Puss in Boots, and other stories through which Richard must travel as he undergoes his heroic journey. Gaiman crosses borders between these genres and stories as he relates Richard’s own border crossing from London Above to London Below. Wonder and Healing: Exploring the Land of Lórien / Austin, Emily. In The Fellowship of the Ring, the chapters focused on Lothlórien explore both pain and healing. After enduring physical hurts and emotional trauma, Frodo and his companions take a certain measure of comfort from the various wonders they encounter, from the mystery of Mirrormere and the cleansing nature of Nimrodel, to the ancient memory of Cerin Amroth and Galadriel’s wise gifts. In Lórien the Fellowship finds rest and respite from worry, which enables them to experience their grief in a way that promotes eventual healing. Indeed, Tolkien seems to portray wonder as a component of healing. Each of the awe-inspiring encounters in these chapters makes use of repeated images that cause the characters to marvel at their beauty and mystery. These images include moving, musical water, shining stars and jewels, and white flame—all pure and powerful natural elements. These natural images often hint at deeper supernatural powers working through or alongside them. Tolkien’s portrayal of Lórien leaves us, the readers, feeling just as amazed as the characters experiencing it in the story. I have been exploring these passages in the medium of watercolor painting, attempting to visually evoke the feelings of wonder and awe Tolkien describes. This presentation will display my completed works along with some of the smaller studies I create during the planning process. I will talk about the different stages I follow when creating art, from reading and research to executing a final piece, and reflect on how words and visuals can interact with and enhance one another. The Door Called Death / ben-Avraham, Kay. “The Door Called Death” is a fairy tale of a young man on a journey to find the Summer Mountain, where the god dwells. He fears to journey and demands that his elders, despite their protestations, provide him with a map, which he then encases in stone and carries with him. Yet the map fails him, and he must in the end abandon it and submit to unknowing, with the aid of a strange, numinous companion who summons for him the Door Called Death. The Boy Who Didn’t Know How to Recognize a King / Painter, Mark. My story entitled “The Boy Who Didn’t Know How to Recognize a King” is due to be published in the Spring 2018 issue of Aliterate, the magazine of literary genre fiction. The story is based on a traditional Cambodian folk tale, “The King and the Buffalo Boy.” The story will have been released online by the time of this presentation. I will read some of my story and speak about Cambodian folklore, leaving some time for discussion. Editor’s Note: Mark’s story is now available open access and can be read in full in Aliterate’s Spring 2018 issue. The LOTRO Epic Story in Alliterative Verse / Raley, David. One of the features of The Lord of the Rings Online (LOTRO) is the epic story. This story runs parallel and occasionally interacts with the story from the novels. This presentation covers the first two volumes of the epic story. also includes introductory material for the race of man. also includes a prologue set in the days of Durin VI. This presentation includes two forms of alliterative verse. For the main body, the poem follows the standard four lifts-per-line format. For the final stanza of each book, the format switches to ljóðaháttr (i.e., a 4/3 format). The sample below covers the tutorial section of the epic story. ‘Til Amdir’s sword swung and killed them. But Amdir fell to a festering blow. And plot a path to Archet. For ruin was ready to strike. Mythmoot V Proceedings (2018) by the respective authors is licensed under a Creative Commons Attribution-NonCommercial-NoDerivatives 4.0 International License.